This manufacturing process is what I call the “Casting Cycle”. From my point of view, the Casting Cycle can be broken down into 8 distinct and separate phases which must be completed in a set amount of time to make a quality bullet. Let’s take a closer look at a typical Casting Cycle and see how long it takes, in terms of the number of seconds needed per phase, to cast a quality bullet. Remember, the times shown in the example above will vary based upon the mould, caliber, weight, and melt ratio you are using, as well as the outside air temperature and air movement within and around the casting area. Any variation in the length of time spent on any one of these phases will alter the overall total time per bullet. For example, if you increase the length of Phase 5 (Letting The Melt Harden) from 15 to 25 seconds, you are allowing the mould to cool for an additional 10 seconds before moving to Phase 6. In the process you have changed the overall total time of the Casting Cycle from 50 to 60 seconds. That additional 10 seconds may not sound like much but it will change the temperature of the mould enough to make your next bullet slightly lighter than you would like. If on the other hand you reduce the length of Phase 5 from 15 to 5 seconds, you have also shortened the length of the overall Casting Cycle from 50 to 40 seconds. The amount of time the mould has to cool has now been reduced by 10 seconds. As a result, when you cast the next bullet the mould will be several degrees hotter than you might like and that temperature difference will result in the next bullet being slightly heavier. alter the weight of the melt. This is especially true for those of you who use a bottom-pour dipper, since your dipper actually sits directly on top of the sprue plate. 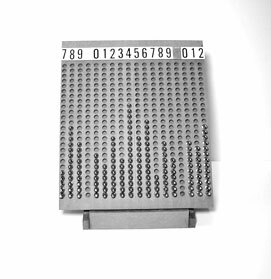 If you are not consistent in filling your dipper with melt, the internal pressure of the melt as it enters the mould will vary from one bullet to the next. Although the difference in pressure may not be much, it will have an effect on the way your bullet fills out and can be enough to affect the weight of your completed bullet. Phase 1 does not really apply to those of you who use a bottom-pour furnace, since the melt you are using is already at the point of delivery and ready to be dropped into the mould. Phase 2 brings the dipper (in my case an RCBS bottom-pour dipper) into direct contact with the mould, along with its 800 degree contents (my preferred casting temperature). For those of you who use a ladle or a bottom-pour electric furnace, you may never touch the mould. In that case you are not transferring extra heat to the mould, as would someone using a dipper that comes into direct contact with the sprue plate. There are several things we need to watch here. If Phase 2 is too short, the mould may not have sufficient time to fill out completely and our bullet will have rounded edges and possibly a void inside. If Phase 2 is too long, the melt will start to harden before we remove the dipper. From my experience, 3-8 seconds is usually more than enough time to fill the mould. In addition, if we don’t get a good tight contact between the spout of the dipper and the opening in the sprue plate, our melt will flow into the mould unevenly and our pour will not have the consistent, even pressure that results when the spout and sprue plate mate evenly. This uneven flow of melt into the mould can cause imperfections and voids. In Phase 3 our goal is to control the amount of molten material used to form the sprue puddle on top of the mould. Pouring too much or too little melt during this phase can have equally negative results. Too much melt can raise the temperature of the mould beyond our desired level. Using too little melt to form the sprue puddle can result in the mould being starved for material and leaving a void in the bullet. Paul Matthews refers to this process as “Feeding the Riser”. Although there are times when we may want to pour a little extra hot melt over the mould in order to get it up to temperature initially or after a break, during our normal casting routine we want our sprue puddles to be as close to the same size and shape as possible. If we are inconsistent in forming the sprue puddle (i.e. we use a lot of melt one time and very little the next) we will cause the temperature of the mould to fluctuate more than desired. Forming a generous and well-defined sprue puddle consistently from one bullet to the next helps to insure that the mould cavity is not lacking for material. If you use a bottom-pour dipper, forming a nice, neat sprue puddle on top of the mould is virtually impossible. As soon as you remove the dipper from the sprue hole the remainder of the contents in the dipper will pour out and bathe the sprue plate with hot melt. About the best you can hope to do is to remove the dipper the same way with each bullet you cast and use approximately the same amount of melt to cover the sprue plate. Once the bullet cavity has been filled with hot melt, the casting process moves to Phase 4. Phase 4 is a good indicator of the temperature of your melt. If your melt takes more than a few seconds to get that frosted look, chances are that it’s getting too hot. When that happens, you may want to use your thermometer to check the temperature of the melt. If the melt frosts almost immediately after removing the dipper from the sprue opening, chances are your melt may not be hot enough. Once again, check it with your thermometer. Phase 5 is the cooling-down period and is the easiest to accurately adjust. Most casters simply count in their head for 5 to 30 seconds before going to the next phase. The length of time allocated for Phase 5 will depend largely on the weight of your bullet and the temperature of the melt. Generally, the lighter the bullet or the cooler the melt, the shorter the amount of time needed for the melt to harden sufficiently so you don't tear out pieces of the bullet base when cutting the sprue. Some casters don’t have a Phase 5 in their Casting Cycle. As soon as the sprue puddle frosts over, they immediately cut the sprue and drop the bullet out of the mould. Personally, I have never been able to accurately control the temperature of my moulds if I cut the sprue immediately. If you can do this with your melt temperature and mould combination while keeping your mould from picking up too much heat, then you’re ahead of the game. You should be able to cast more bullets per hour than those of us who must wait. This stage has a lot to do with the quality of the base of the bullet. If you are cutting the sprue and in the process tearing out a small amount of base material, you need to lengthen the amount of time you are waiting to let the melt harden a bit longer in the mould. A smooth, blemish-free base is what we want to see when the bullet drops from the mould later on. If the melt is still soft when we go from Phase 5 to Phase 6 of the Casting Cycle, we may ruin what would have otherwise been a perfect bullet. Although Phase 6 does not directly affect the temperature of the mould, any delay in executing the cutting of the sprue will add time to the Casting Cycle and throw off your established time intervals. This in turn will result in the next bullet being slightly different in weight. The most common problem we run into in this stage is having the melt stick in the sprue hole after we swing the sprue plate across the top of the mould. When this happens, we generally have to dislodge it with a small pointed pencil or sharpened wooden stick. Taking time to do so can add several seconds to the overall time of the Casting Cycle and disrupt our cadence. If this happens to you on a regular basis, I would suggest treating the sprue plate and sprue hole on your mould with a product like Rapine’s Mould Prep. This product will provide a slippery, non-stick coating which will make it difficult for any melt to foul your mould. Most of these products do not provide a permanent coating, so regular maintenance and reapplication are required. However, they will save you a great deal of aggravation and also provide a protective covering to protect your mould from rust, if that is a problem in your area. Phase 7, like Phase 6, does not directly affect the temperature of the mould. But here again, any delay in dropping the bullet from the mould will add time to your efforts and result in a slightly cooler mould for the next Casting Cycle. During this phase a sticking or hard-to-dislodge bullet is usually the culprit. If a bullet sticks in the mould and does not drop out cleanly, you may need to rap the handles of the mould with a heavy wooden dowel or rubber mallet to break it free. Remember, never strike the mould directly. 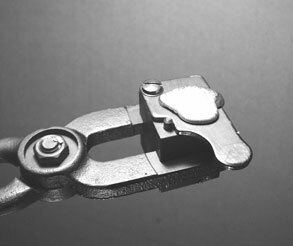 Always tap the handles or handle hinge pin to generate the necessary vibration needed to dislodge a troublesome bullet from the mould. 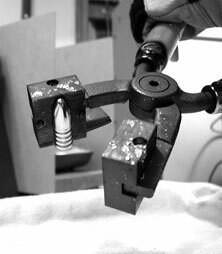 A hard-to-dislodge bullet can add valuable seconds to Phase 7 of the Casting Cycle and alter the temperature of the mould for the next bullet. 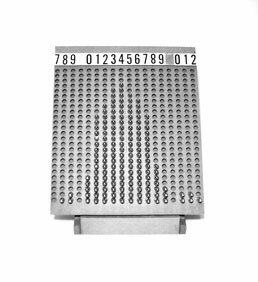 My Lyman 457132 Postell mould is a delight to use because the bullet drops out of the mould as soon as the blocks separate. However, from time to time I’ll encounter a few bullets that act like they were cast with Super Glue and don’t want to budge. Although rapping on the handles usually dislodges them after one or two blows, the time it takes to do so can easily add an extra 5 or 10 seconds to the overall time of the Casting Cycle. When that happens, I can always count on the next bullet being slightly lighter due to the extra time the mould has had to cool before casting the next bullet. Like the two previous phases, this phase does not directly affect the temperature of the mould. However, any delay in closing the mould and setting-up for the next bullet will lengthen the overall time of the Casting Cycle and give the mould more time to cool than you may like. Generally in Phase 8, the biggest problem you will encounter is when excess melt on the outside of the mould makes its way between the mould blocks and prevents you from closing the mould completely. In that case you will need to take a sharp, pointed wooden carpenter’s pencil or hardwood stick to clean away the excess. Don't use any type of metal instrument (i.e. screwdriver, dental pick, carpenter's awl, etc...) which might scratch or gouge your mould. Understanding the 8 phases of the Casting Cycle and the importance they play in producing a high quality bullet within a narrow weight range is very important. Devising ways of establishing and maintaining a uniform and consistent Casting Cycle is the key to achieving superior results. Why? Because that’s how we keep the bullet mould at the same constant, even temperature for every bullet we cast. Keeping the mould within a few degrees with each bullet we cast is one of the most important things we can do to insure that we get consistent results. I believe from my own experience and those of other veteran casters that we can tolerate a certain variation in melt temperature. But if we allow the temperature of the mould to change by more than a few degrees from one bullet to the next, the result will be bullets that vary widely in weight. Depending upon your style of casting, one or more of the 8 phases of the Casting Cycle described may not apply to you. For example, those of you who cut the sprue as soon as the melt takes on that frosted appearance are basically skipping Phase 5 of the Casting Cycle as I have defined it. As I mentioned earlier, although I have tried cutting the sprue immediately, I have not been able to do so and keep the mould at a manageable temperature. After just a few bullets, my moulds retain too much heat and bullet weights start to climb. Consider yourself lucky if you can do so. One of the benefits of cutting the sprue when the melt frosts over is that it shortens the amount of time required to cast each bullet and therefore increases the total number of bullets you can cast in a given time period. The key is to manage these 8 phases within a set period of time. To do that you need to experiment to find a total overall amount of time for the 8 phases of the Casting Cycle to take place (i.e. 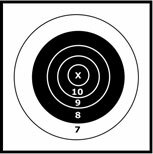 30 seconds, 40 seconds, 60 seconds, etc...) that will produce bullets in the weight range you desire, and then repeat each phase of the cycle exactly the same way with each bullet you cast in order to produce nearly identical results. Many of you experienced casters may already be doing this on a subconscious or intuitive basis. You may not have consciously broken down the casting process into the phases I’ve outlined or given much thought to the amount of time allocated for each phase, but you may be doing many of things I have discussed already. If you’re casting bullets that fall within plus or minus 1/2 grain, then you are certainly doing something right. I think that most experienced casters would agree that maintaining a consistent “rhythm or cadence” to your casting is absolutely critical if you want to cast high quality bullets within a narrow weight range. Wide fluctuations in the amount of time you spend on casting each bullet will result in the mould temperature varying enough that the next bullet cast will be several tenths of a grain or more different in weight. For example, if it takes you 45 seconds to complete one bullet and 60 seconds to complete the next bullet, your results are going to suffer. Experience and logic tell us that a cooler mould will throw a lighter bullet while a hotter mould will throw a heavier bullet. one-tenth grain increments (i.e. 530.1, 530.2, 530.3, etc...). When everything is going well (the board on the left) , the output from a good day of casting will produce a bell-shaped curve with 95% to 98% falling within a 1 grain weight range or smaller. The board on the right is the result of erratic performance resulting in a wide variance in weights. There you have it! Eight phases which I call the Casting Cycle — each contributing to keeping the mould at the optimum temperature for casting bullets within a given weight range. But how do we keep these phases in sync from one bullet to the next? Is there a simple, reliable way of keeping the mould hot when we have to take a break or are interrupted during our casting session? And how do we know exactly how much each bullet weighs during our casting session so we can make adjustments as we go? In Part 2, we will look at several simple, inexpensive accessories that you probably already own that will help you to do just that!